To claim this profile, please confirm you are Clare Moran. To follow this profile, please let us know your relationship to Clare Moran. Clare's basketball stats have been updated for the loss vs. Auburn. Clare's basketball stats have been updated for the win vs. Immaculate Heart Central. 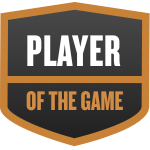 Clare was selected the Player of the Game in the basketball game against Watertown on Wed, Feb 06 2019. Clare is the Player of the Game for her all out hustle including 7 rebounds (6 offensive) and 5 steals!! Clare's basketball stats have been updated for the win vs. Watertown. Clare's basketball stats have been updated for the loss @ Massena. Clare's basketball stats have been updated for the win @ General Brown. Clare's basketball stats have been updated for the win vs. Norwood-Norfolk. Clare's basketball stats have been updated for the win @ Watertown. Clare's basketball stats have been updated for the win @ Immaculate Heart Central.